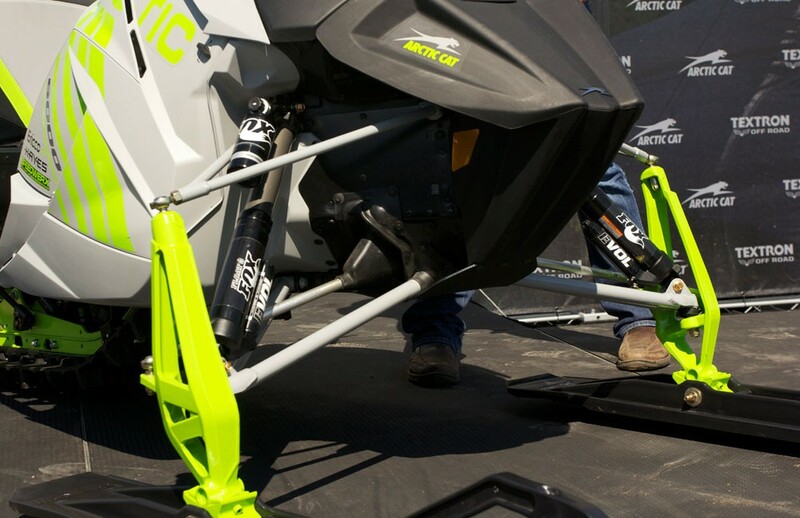 With faithful Cat fans in attendance, we got our first glimpse of the new 2018 Arctic Cat ZR6000R SX race sled at the Hay Days event in North Branch, Minn.
Arctic Cat’s intense effort building its 2018 Arctic Cat ZR6000R SX race sled is very obvious. Its passion extended to direct input from Tucker Hibbert and Logan Christian, other racers, and surely the Black Cats. It doesn’t just look different, it is different. 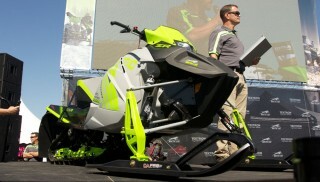 Arctic Cat made leaps and bounds and reduced its sled weight by 20 pounds. Yes, 20 pounds! In doing so, it designed a new rider cockpit that is 10% narrower. It has a new fuel tank, console, side panels, headlight, and the upper frame work. So much of the 20-pound diet greatly lowers the center of gravity. Sitting and standing on the sled you can feel how these changes will allow riders exceptional control and comfort when maneuvering and cornering. Cat released taller spindles that are designed to improve cornering and clearance. The new spindle increased the distance from the ski bolt to the lower A-arm by 1.5”, in effect raising the new bodywork out of the snow in huge bumps, reducing chassis bottoming and drag. The new upper A-arms share lightweight M series DNA, allow adjustable camber, and lead to a castor change. The ZR’s intake is now in front of the upper A-arms under the hood. The small and aggressive new front intake/nose cone is exceptionally elevated and narrow on the 2018 Arctic Cat ZR6000R SX. Cat incorporated a new intake system on the underside this year working to reduce snow ingestion from roost when moving through lap traffic. It looks near impossible to bottom out the front end for 2018. 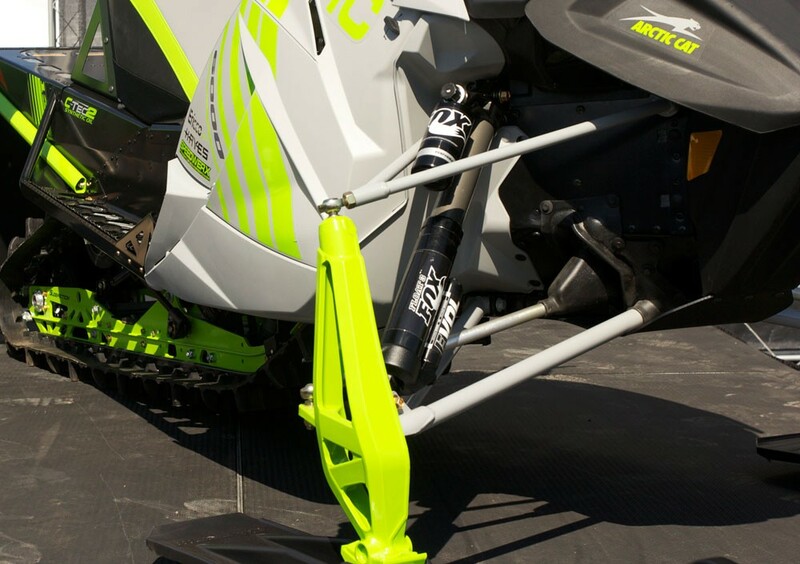 Arctic earns another industry first as the only manufacturer with a 136”, 2.52 pitch track on its race sled. The skid attack angle is more aggressive and that alone gained 2” of extra track on the ground. Coupled with the added 4” at the rear thanks to the 136” track, the new SX is ready to grind holeshot battles with the G4 RS and 600R. The C-TEC2 600 DSI improvements include different cylinders, new aluminum exhaust valve combo, and 100% new mapping. Cat is looking for a 20% mid range power increase from these changes. Corner to corner acceleration should be greatly increased. The new SX headlight is very lightweight, but it actually shares its part number with another sled, the ZR200!! Mad props to AC for exciting the youngsters! The revised TSS secondary is mated a new 30mm hollow splined jackshaft, which reduces inertia and added to the 20-pound diet. It also introduced a new hollow jackshaft, again reducing weight. Here’s what Tucker Hibbert had to say when referring to his ’15/’16 Pro Open sleds and the new 2018 Arctic Cat ZR6000R SX. 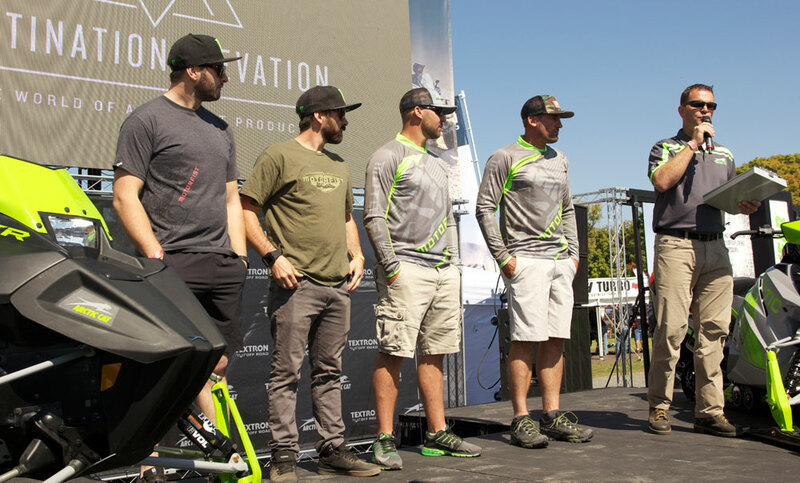 Arctic Cat’s Black Cats featured in the film “Destination Elevation” include: Rob Kincaid, Dave McClure, Cory Davis and Brett Turcotte. Arctic Cat and Textron put on a great reveal, including some Textron information and the Black Cats Video “Destination Elevation” that got the crowd pumped!